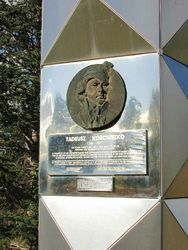 The Tadeusz Kościuszko Monument was a bicentennial gift from the Federal Council of Polish Associations to commemorate the discovery of Mount Kosciuszko and the contributions of Polish settlers to the Snowy Mountains Scheme. 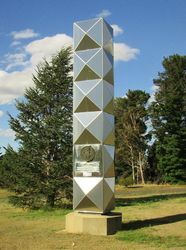 The monument comprises a six metre stainless steel sculpture on a concrete base with plaque and bust. Tadeusz Bonawentura Kościuszko (1746 – 1817) was a Polish, American, Belarusian and Lithuanian national hero and general. He led the Kościuszko Uprising (1794) against Imperial Russia. Prior to leading the 1794 Uprising, he had fought in the American Revolutionary War as a Colonel in the Continental Army. In 1783, in recognition of his dedicated service, he had been brevetted by the Continental Congress to the rank of Brigadier General, and that same year he had become a naturalized citizen of the United States. Mount Kosciuszko, is situated in New South Wales and is recorded as having a height of 2230 metres. It was named in 1839 by Polish explorer, Paul Edmund de Strzelecki after Polish leader, Tadeusz Kościuszko. THE POLISH PATRIOT AND HERO, SPENT MOST OF HIS LIFE FIGHTING FOR THE FREEDOM OF HIS COUNTRY. A CHAMPION OF THE UNDERPRIVILEGED AND OPPRESSED IN POLAND, HE WENT TO AMERICA TO BECOME ONE OF GEORGE WASHINGTON’S GENERALS, GAINING MUCH HONOUR IN THE WAR OF INDEPENDENCE. IN THOMAS JEFFERSON’S WORDS, HE WAS “AS PURE A SON OF LIBERTY AS I HAVE EVER KNOWN”. Mt Kosciuszko was discovered and named by the Polish explorer Count PAUL EDMUND STRZELECKI in 1840. This monument is raised by the Federal Council of Polish Associations in Australia as a gift to the people of Australia in the Bicentennial year 1988. 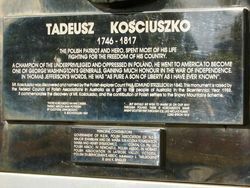 It commemorates the discovery of Mt Kosciuszko and the contribution of Polish settlers to the Snowy Mountain Scheme. "Patrz Kościuszko Na Nas Z Nieba ..